Given the ever-increasing influence of African born- and bred- businesses in driving economic growth and prosperity in Africa, The Initiative for Global Development’s Frontier 100 Forum will strategize on how to strengthen Africa’s private sector development to spur innovation, job creation, and global competitiveness on the continent. The Frontier 100 Forum will be held on October 19-21, in Washington, DC. The Initiative for Global Development (IGD) is a U.S.-based organization that engages a network of leading global business leaders from the U.S., Africa and other regions in creating growth and alleviating poverty in Africa through strategic, successful business investment. The Frontier 100 Forum, which begins on Oct. 20, is an exclusive, invitation-only biannual event that brings together CEOs and senior executives from the IGD network of U.S., African, European and South Asian companies who are part of IGD’s Frontier Leader Network. More than half of IGD Frontier Leaders hail from the African continent. Under the theme, “African Business in the World-Class Space”, the Forum will celebrate the dynamism and importance of African businesses -- not only on the continent -- but also in the global marketplace. Today, homegrown African businesses create more than 80 percent of jobs in their countries. The rapid progress and growth of African companies reflect the changing business environment in Africa and have ignited a greater interest in the continent as an investment destination. “A decade ago, foreign investors dealt primarily with governments to do business in Africa because there wasn’t a strong, well-developed African private sector. Today, there’s a thriving private sector in Africa, enabling investors and global business leaders to do business directly with African counterparts,” said Dr. Mima Nedelcovych, IGD’s President & CEO. The Frontier 100 Forum convenes in Washington, DC this week to strategize on how to strengthen Africa's private sector development to spur innovation, job creation, and global competitiveness. The forum is sponsored by the Initiative for Global Development's (IGD), a U.S.-based organization that engages business leaders from the U.S., Africa and other regions in creating growth and alleviating poverty in Africa through strategic, successful business investment. Under the theme, 'African Business in the World-Class Space', the forum will celebrate the dynamism and importance of African businesses. “Although impediments still exist in fostering stronger business environments in Africa, homegrown African businesses are building some of the fastest-growing companies and are poised to become a major force for growth on the African continent,” said Nedelcovych. The Frontier 100 Forum is designed to encourage business leaders to offer insight, collaborate, and identify bold, action-oriented strategies to promote growth and poverty alleviation in Africa from a business perspective. Forum topics will range from strategies to propel African companies to successfully become world-class companies; changing global perceptions about doing business in Africa; sparking African innovation; and corporate social responsibility. 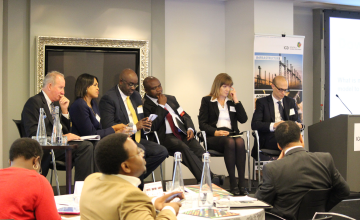 The Forum will feature a half-day session on the tremendous opportunities and perceived risks to investing in Africa. One day prior to the Forum, IGD will host on Oct. 19 with the Partnership to Cut Hunger and Poverty in Africa (PCHPA), a special pre-forum luncheon discussion on “Raising the Bar for Africa’s Infrastructure Investment: Meeting Current Business Needs & Future Demand”. The luncheon will highlight perspectives on best practices and lessons learned on building infrastructure through public-private partnerships from visiting high-level private sector investors from Latin America, Asia, Europe and the Middle East. The luncheon will be attended by members of the African Diplomatic Corps and representatives of Washington-based organizations working on this issue. The Initiative for Global Development (IGD) is a 501©(3) organization that drives poverty reduction by catalyzing business growth and investment in the developing world. IGD brings together an influential Frontier Leader network of CEOs and senior executives with the interest and capacity to make strategic investments in high-need, high-potential regions of Africa. Former Secretaries of State Madeleine K. Albright and General Colin L. Powell are co-chairs of IGC’s Leadership Council. For more information, visit www.igdleaders.org.